Racing tips: A Surge through Sandown’s field? Insurgence can bounce back from a lacklustre effort last time by winning the Club188 Exclusive Offers Handicap at Sandown. James Fanshawe’s charge had made strides on the all-weather, winning three of his four starts, including a competitive heat at Kempton last month. However, switched to turf at Yarmouth at the end of June, Insurgence struggled to make the same kind of impact, trailing home an eight-length fourth. Heartwarming had to settle for second at Sandown last month but can step up on that in the Club188 Hospitality EBF Maiden Fillies’ Stakes back at the Esher track. 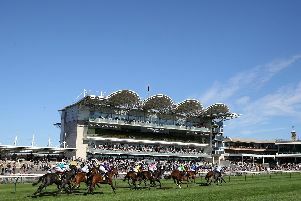 Employer is the pick in the Bet & Watch At 188bet.co.uk Handicap after a close-run thing last time out. Oasis Fantasy lost by a neck on his most recent outing but the Tom Cribb Handicap at Leicester appears a good opportunity. Jfoul is worth a try in the Smith & Graham/Love Property Nursery Handicap at Catterick, despite making hard work of winning at Chelmsford. He ran with the aid of a hood but will be without the headgear here, which is an intriguing decision from Saeed bin Suroor. The Newmarket trainer should also be on the mark at Lingfield, with Mokhles in the Oilfield Offshore Underwriting Handicap. He posted his best effort yet when second on his most recent start and is reasonably treated for his handicap bow. Bath: 2.00 Bayshore Freeway, 2.30 Matchmaking, 3.00 Kath’s Legacy, 3.30 Slowmo, 4.00 Amberine, 4.30 Global Rose, 5.00 Rastacap. Catterick: 2.10 Kuwait Station, 2.40 Liberty Diva, 3.10 Jfoul, 3.40 Super DJ, 4.10 Merry Banter, 4.40 Silverlight, 5.10 Deben, 5.45 Itlaaq. Leicester: 5.30 Carlovian, 6.00 Moretti, 6.30 Gisele’s Angel, 7.05 Oasis Fantasy, 7.40 Ghayadh, 8.10 Clenymistra, 8.40 Christmas Night. Lingfield: 1.50 Live Dangerously, 2.20 Joyful Dream, 2.50 Mokhles, 3.20 Sharp And Sharper, 3.50 Rebel Assault, 4.20 Uncle Jerry, 4.50 Curious Fox. Naas: 5.40 Focus Of Attention, 6.10 Boston Bruin, 6.40 Caldbeck, 7.15 Tirania, 7.50 Rosin Box, 8.20 Conclusion, 8.50 Maths Prize. Sandown: 5.50 Lyrica’s Lion, 6.20 Heartwarming, 6.55 Glamorous Rocket, 7.25 INSURGENCE (NAP), 8.00 Employer, 8.30 Just In Time.